You are here: Home / News / Meetings - Reports - Publications / Call for Soil Hydraulic data! Any metadata describing the experimental data in more detail are welcomed. 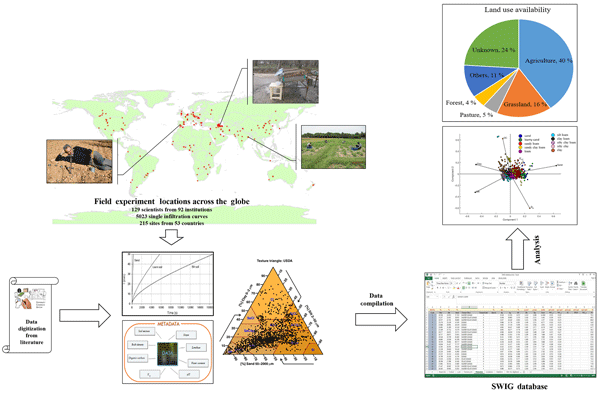 Data may stem from lab scale, plot, field and catchment scale experiments. We are planning to establish a database of these data that we will submit to a data journal (e.g. Earth System Data Science or any other suitable journal). In order to honor your support, we would like to include you as co-author on the manuscript. We hope that you will contribute to this initiative and welcome any questions you might have. Please use the enclosed template file (excel file) to share data with us. We would also appreciate if you could kindly distribute this request to colleagues that might be interested in contributing to this effort. I have attached an e-copy of our published article in SWIG database for those people who we have had no luck to have their supports for that project.